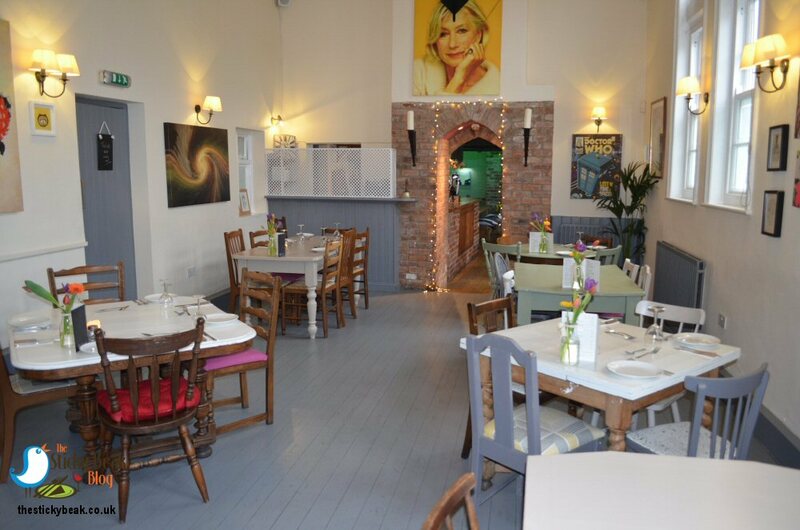 It’s been such a pleasure to finally be able to write about the School House restaurant in South Normanton. As you know, I don’t write negative reviews; if I wouldn’t recommend your venue to friends and family then you don’t get a written review, simple as that. 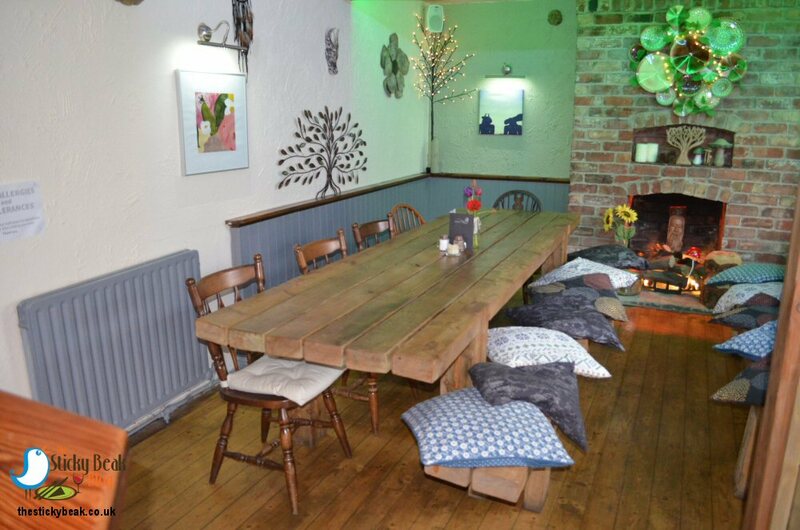 A couple of years ago The Man Bird and I went to the School House restaurant and had a less-than-fantastic experience there under the previous ownership, so I was unable to write about it. Anyhow, Martin and his partner Sophie bought the business late last year and opened in October 2016, and have quietly been building their base up. 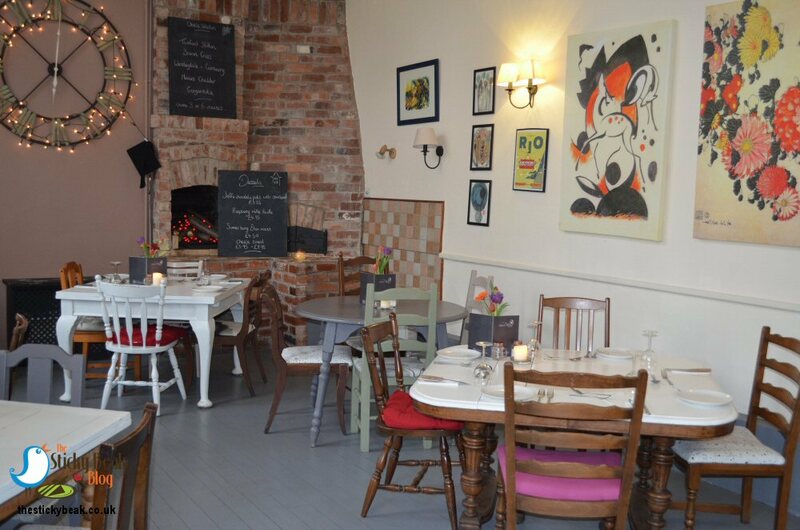 A fresh lick of paint on the walls has brightened things up, along with an eclectic mix of abstract and modern art. The original brickwork has largely been left exposed and the stunningly huge windows allow light to flood in to the large open room. 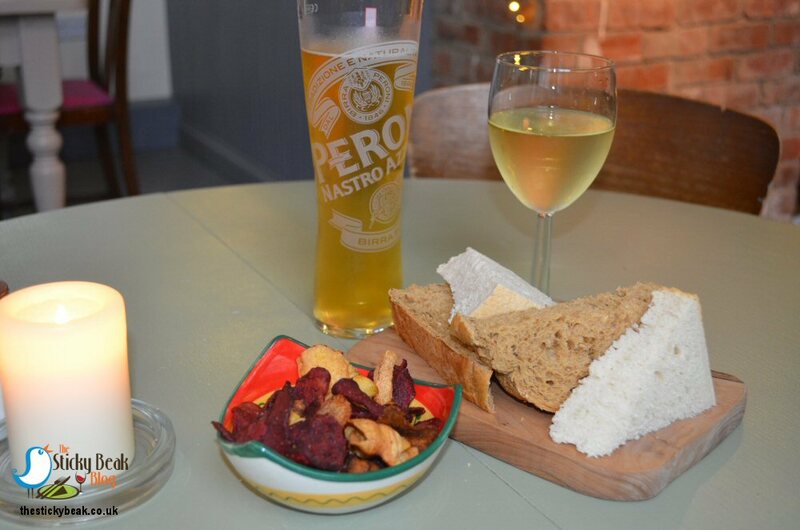 The bar area is very well stocked and there are high tables and stools to perch on whilst you have a drink and nibble on Olives or Root Vegetable crisps. 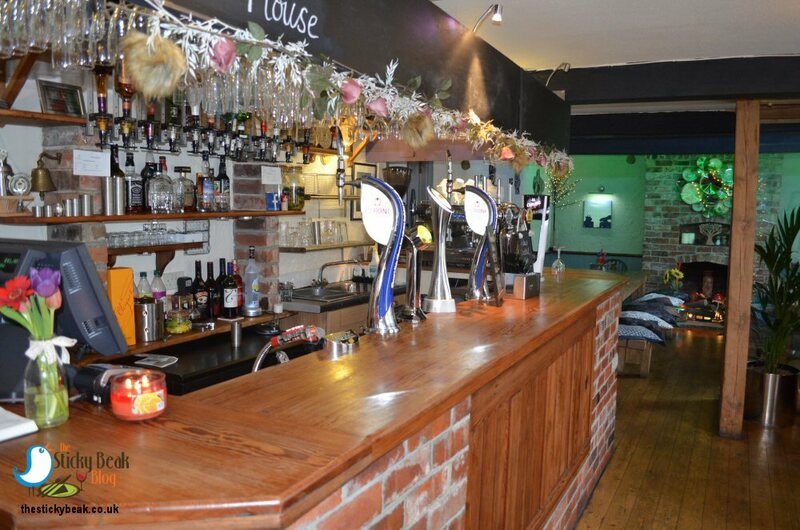 To the right of the bar is an area with a couple of tables in; one is a large bench perfect for groups of friends or a family to dine together. 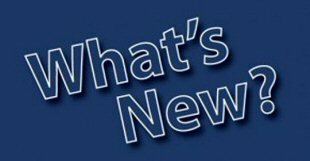 We were seated in the main dining area which is to the left of the bar, and I was pleased to see that the tables are arranged in a far less regimented fashion than on my previous visit. Visually this breaks up the long, straight profile of the space, but it makes it feel so much more relaxed and welcoming too. There was a nice level of music playing in the background as we looked at the menu, given to us by Tyler, a lovely young lady who was our server for the evening. Tyler brought over a colourful nibbles bowl filled with root vegetable crisps of Beetroot, Parsnip and Potato, which we munched on as we decided what to start our meal with. Martin, Sophie and their Chef Paul all love to make the most of seasonal produce; not only does this deliver maximum flavour to the eater, but ensures a regular change in the dishes on the menu. For my starter I had the warm Asparagus salad with boiled egg, shaved Parmesan and Caesar dressing, and His Nibs had the Soup of the Day, which was Cream of Tomato. Having grown up in Lincolnshire I am accustomed to eating a lot of Asparagus when it’s in season as there are a lot of farmers growing this great vegetable in Lincolnshire! The spears at the School House were lovely young, tender morsels that had that wonderful fresh spring flavour to them. 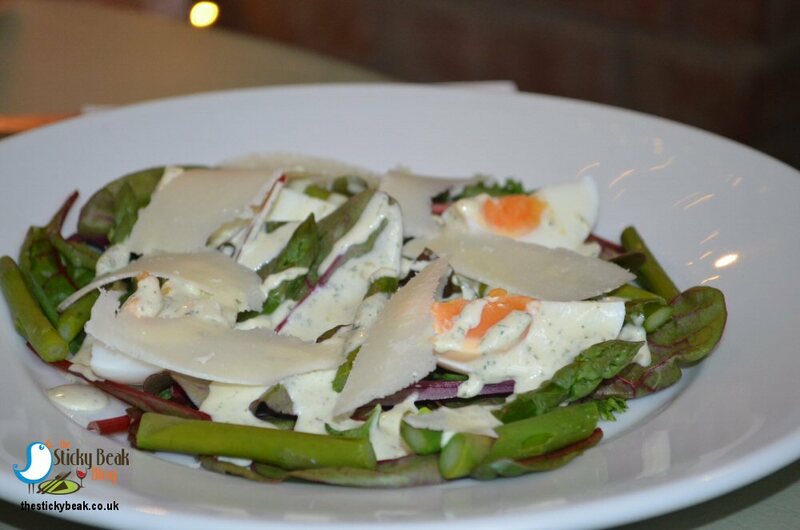 A nice rich egg had been boiled perfectly so that it was firm-but-soft at the same time and both the Parmesan and Caesar dressing gave a nice tang to the dish. All the flavours were balanced and working in harmony, none overwhelmed the other or pushed its way to the front of the palate queue; it was a lovely starter, in short, and it made a nice change to have the Asparagus paired with Caesar dressing rather than the usual Hollandaise. 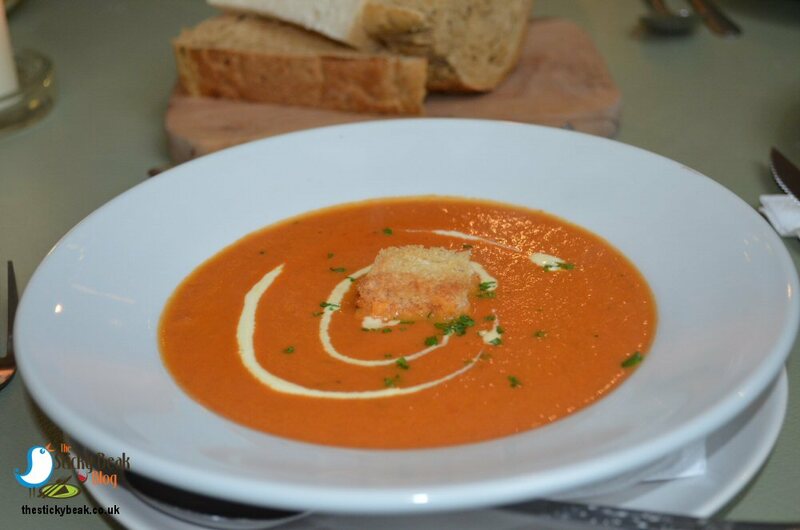 I have often said that the simple things in life are the best and with the Cream of Tomato soup on offer at the School House last night it proved to be true once again. The Man Bird said it was absolutely delicious, with just a nice piquant hint to it from the seasoning. It was bursting with fresh, bright Tomato flavour and thankfully there was plenty of bread to mop it all up with. It needed nothing more than a swirl of cream and fresh green herbs on the top to complete it. Tyler came to check that we were enjoying our starters, which we were, and to see if we needed anything else. When our plates had been cleared away Martin came over to have a chat with us and also to socialise with the other diners in the room, which I thought was nice to see. For our main courses there were several things that caught our beady eyes, note the two that require 24 hours notice though which are the Tomahawk steak for two and the 10oz Rump steak. 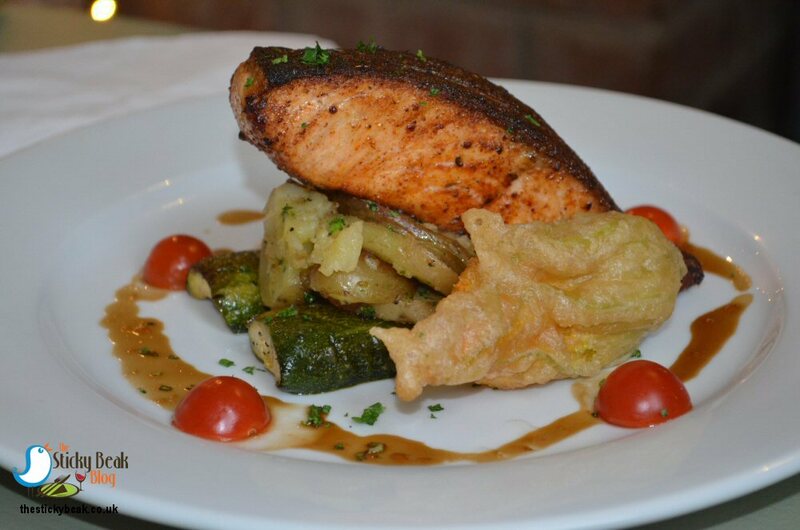 Eventually I settled on the pan fried Cajun Salmon with roasted Courgette, sautéed Potatoes, Cherry Tomatoes, fried Courgette Flower and Balsamic dressing. 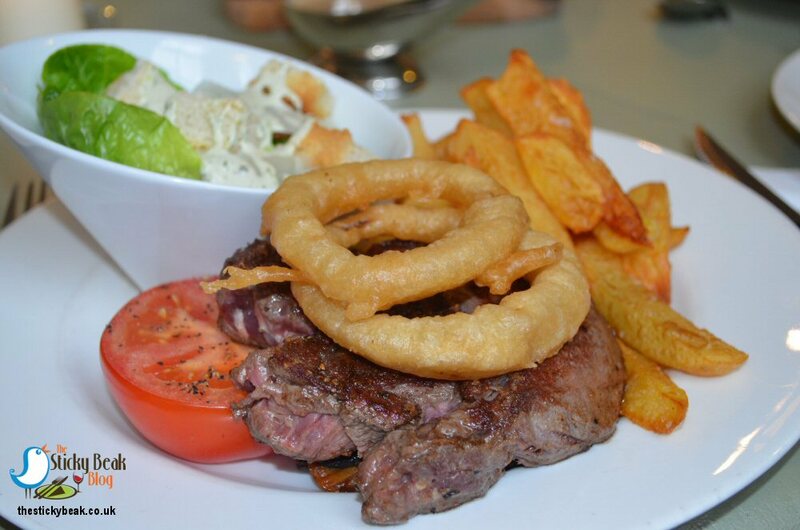 The Boy Wonder fancied the sound of the 8oz Ribeye steak with grilled Tomato, mushrooms, beer battered Onion Rings, Caesar salad and homemade chips. He also had Peppercorn sauce to accompany the steak as an extra. Now you know that some of my pet peeves are over-cooked, dried out fish and soggy vegetables and thankfully I didn’t have to deal with either at the School House Restaurant. Chef Paul kept the natural juiciness of the Salmon intact and crisped the skin up brilliantly. There was a nice level of Cajun spice to enjoy but it didn’t overwhelm the delicate Salmon flavour at all and it was a very thick wodge of Salmon steak, let me tell you. The New Potatoes had been lightly crushed as they were sautéed and the Courgette was nicely firm as I cut into it, so I was a jolly happy birdie. A lot of people don’t realise that you can eat the Courgette flower, or probably wouldn’t want to, but it’s a very delicate flavour and very enjoyable. At the School House, Chef simply fries it in a light crisp batter that doesn’t drown its character and it was just a lovely element to the meal to savour. I love a sweet Cherry Tomato and the ones I had with my Salmon were perfect; warm, but firm, and very sweet to taste. His Nibs had asked for his steak to be cooked medium-rare and that was exactly what he got; nice and pink in the middle with not a drop of blood oozing anywhere. The meat itself was packed full of flavour and was superbly tender; in fact the knife just glided through it with no effort at all. You can’t have a good steak and mediocre chips; it just doesn’t work like that does it? Top marks again for skill in the School House Restaurant kitchen, the chips were superbly crispy outside, soft inside and they were seasoned perfectly. The Peppercorn sauce was also a master class in how to balance creaminess and pepper heat so that both elements can be appreciated on the tongue. A white bowl contained the fresh, crispy Caesar salad so that it retained its freshness and coolness; nothing worse than a warm salad when it’s not meant to be warm! Both the huge beef Tomato half and the mushrooms were nicely cooked too, and the presentation of our main courses was carefully done. Tyler was again told how good the food was and when Martin passed our table we asked him to pass our compliments on to Paul. After having had two brilliant courses it would’ve been remiss of The Man Bird and I not to sample the homemade desserts wouldn’t it? Purely in the name of completeness for review purposes you understand; ok, to indulge my gluttony - I confess! 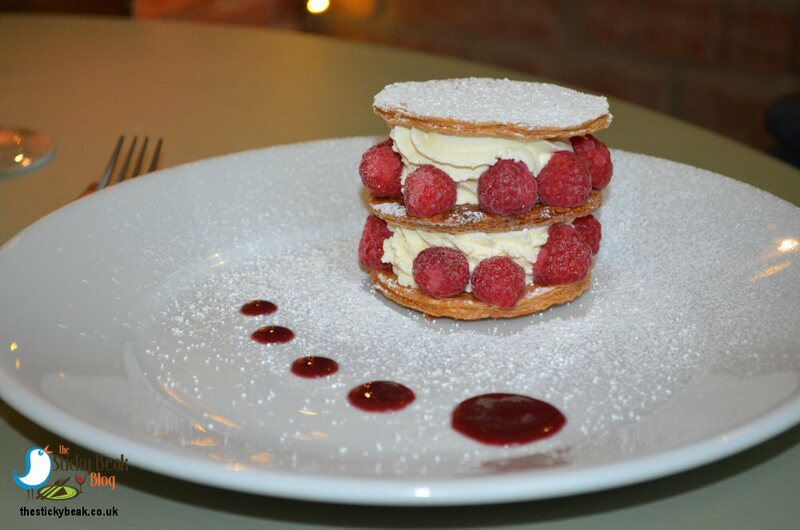 I fancied the Raspberry Mille Feuille; you don’t see this very often and it really is a delicious dessert when done properly. His Nibs was instantly smitten with the sound of the Jaffa Chocolate pots served with Shortbread. After only a short while our puddings were brought out to us, and again their presentation was very nice. The puff pastry of my Mille Feuille was gorgeous and everything you want it to be; light, crisp, flaky and buttery and it was filled with layers of beautiful Chantilly Cream. The fresh Raspberries burst on the tongue with their iconic taste of summer note and the whole dessert was just superb. This is one of my favourite puddings for a while, hats off to Chef again. Just when I thought things really couldn’t get any better, His Nibs said “you really need to try this Ang, it’s mind-blowing”. Having recovered from the shock of the Man volunteering to share his pud, I reached across and dipped my spoon into his bowl. It took a split second for my taste buds to fully appreciate the genius that had landed upon them, but when they did a huge grin spread across my face. Honest to goodness it was Jaffa Cake yumminess in a pot, without the boring cake/biscuit base; a debate I’m not even going to get into here. 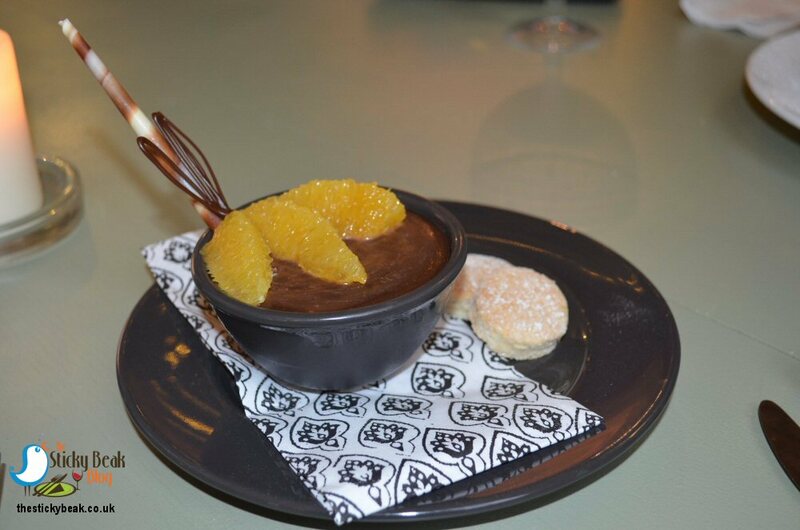 The sumptuous dark chocolate mousse with its delicate orange hint was a joy to behold in itself, but the marvellous Jaffa jelly layer at the bottom was utter genius! His Nibs’ face lit up like Indiana Jones discovering his latest treasure, it really did. For those of you thinking “yeah right, it was just an orangey mousse and jelly” all I can say is that the Jaffa jelly tasted completely different to the fresh orange segments that garnished the top of the dessert. Seriously, you need to come and try it for yourselves then you’ll get it. The delicate hand piped chocolate swirls that also garnished the top were beautiful, so not only did this gem taste fab, it looked the part too. 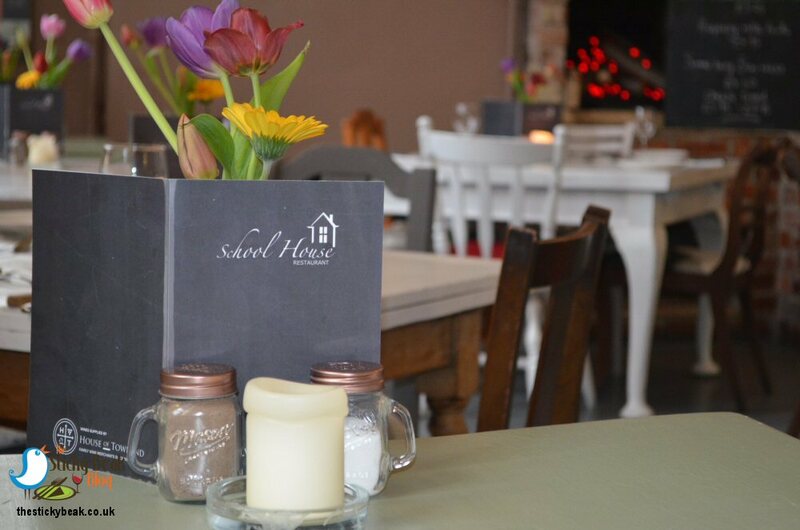 For those of us that have family coming to stay or if you know anyone who travels for business then please tell them that if they’re staying at the Derbyshire Hotel, to consider eating at the School House Restaurant. It’s only a short journey away, very budget-friendly and offers the diner something a bit different. Hot Wings definitely deserved here now, it’s nice to finally be able to put such a well-known South Normanton restaurant on the map!